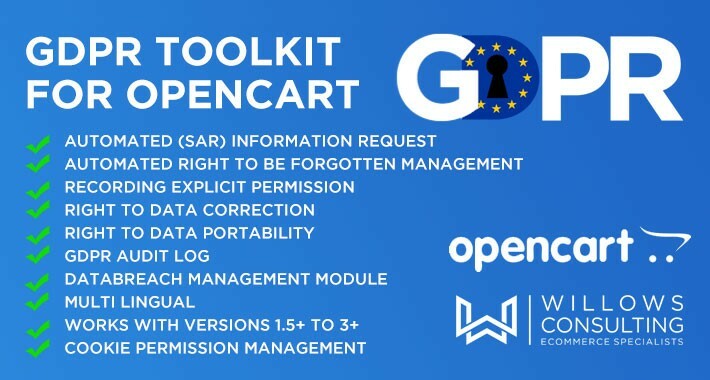 This Opencart GDPR plugin is a set of fully automated tools. 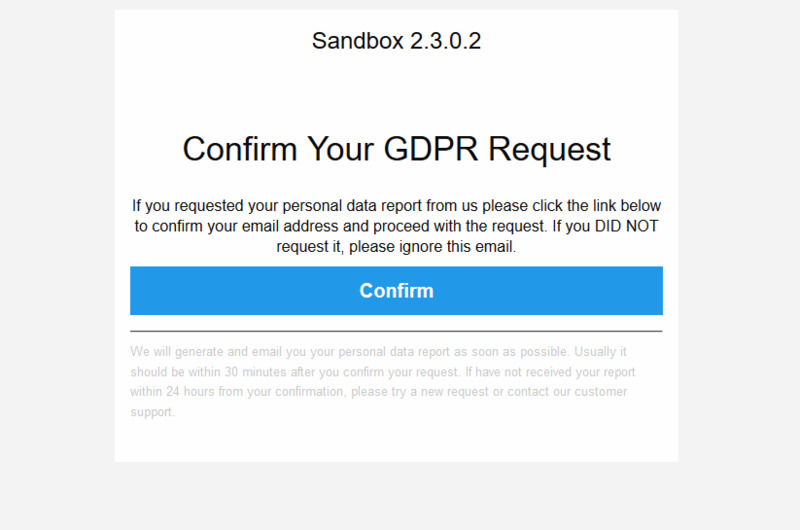 All GDPR requests are self-service. Runs 100% automatically. Designed and Built by certified Data Protection Practitioners. The General Data Protection Regulation (GDPR) (Regulation (EU) 2016/679) by which the European Union intend to strengthen and unify data protection for all individuals within the EU. Enforceable from the 25/5/2018. Note : Any website in the world transacting with EU citizens MUST have this functionality on their website. If you can offer a translation for a language that is NOT supported yet contact us at plugins@willowsconsulting.ie before purchasing the addon, we can provide a free copy of the addon in return for the translation. The Right of Access (Article 15 of GDPR) gives citizens the right to get access to their personal data and information about how their personal data is processed. 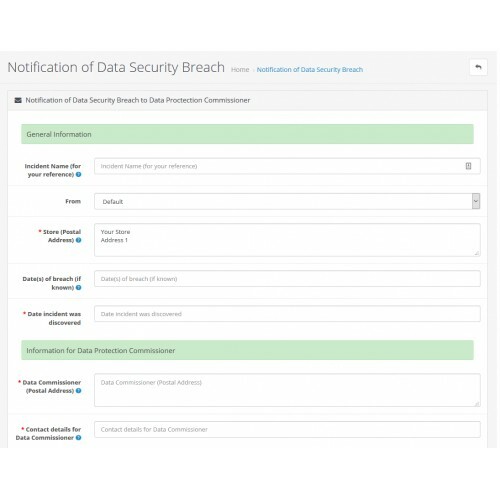 The Data Controller (You) has to provide, upon request, an overview of the categories of data that are being processed (Article 15(1)(b)) as well as a copy of the actual data (Article 15(3)). 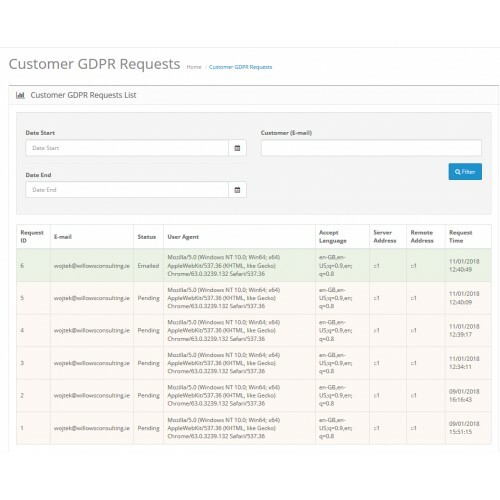 - 'Right of access to personal data' - a process that will allow customer to request and retrieve their personal data stored in OpenCart. 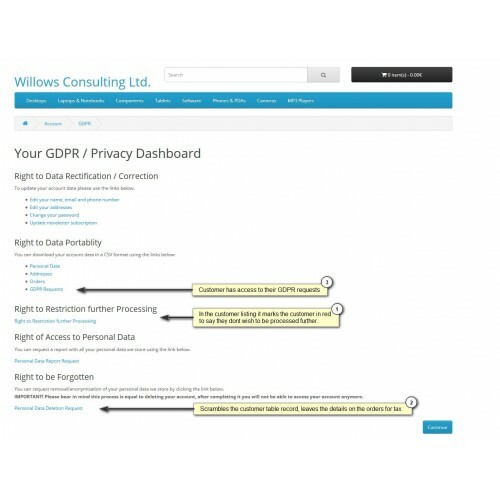 - 'Right to be forgotten' - a process that will allow customer to have their data anonymized/deleted. 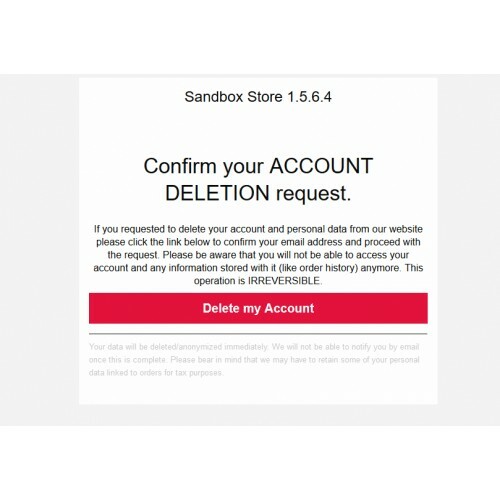 - 'Explicit store policy acceptance' - whenever customer accept the store terms at account registration or checkout this is stored along with date-time stamp. 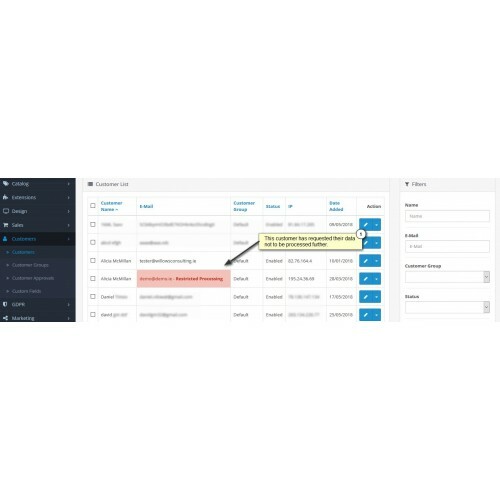 Store owner will have access to a report of all policies accepted and the content of the policies accepted by the customer can be retrieved in case of a dispute. 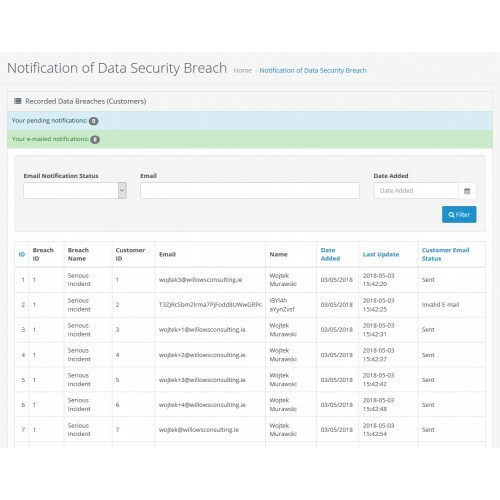 - 'Data breach notification system' - this allows the store owner to generate and send a notification letter to Data Protection Commissioner and notify their customers about data security breach (available for OC2+). - Guest Shopper Support - allow guest shoppers to retrieve their information. 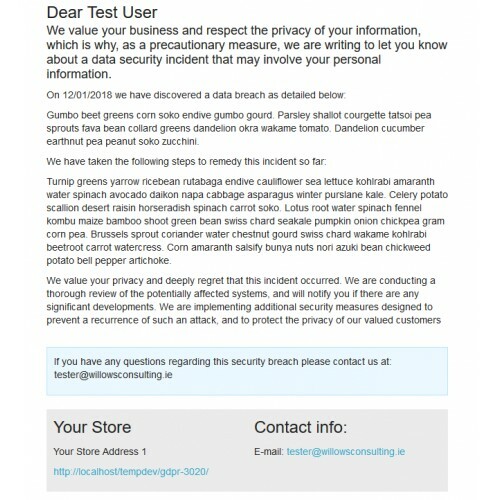 - 'Right to restrict processing' - this will allow customer to request that their data will not be processed in any way anymore by the store. Cookie Control prevents cookies from being placed on a user's computer until they have given their explicit consent via an affirmative act. 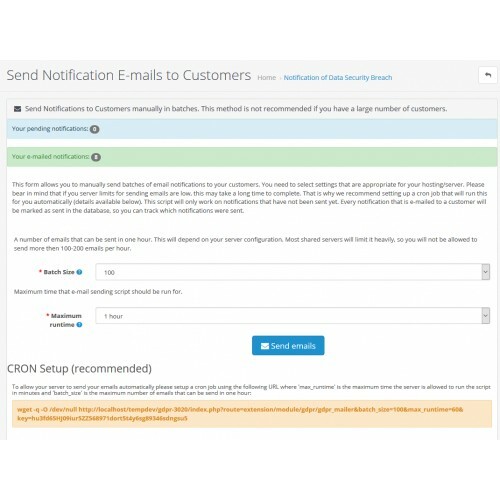 With a recognisable, ever present icon, user's can easily manage their consent at any time. 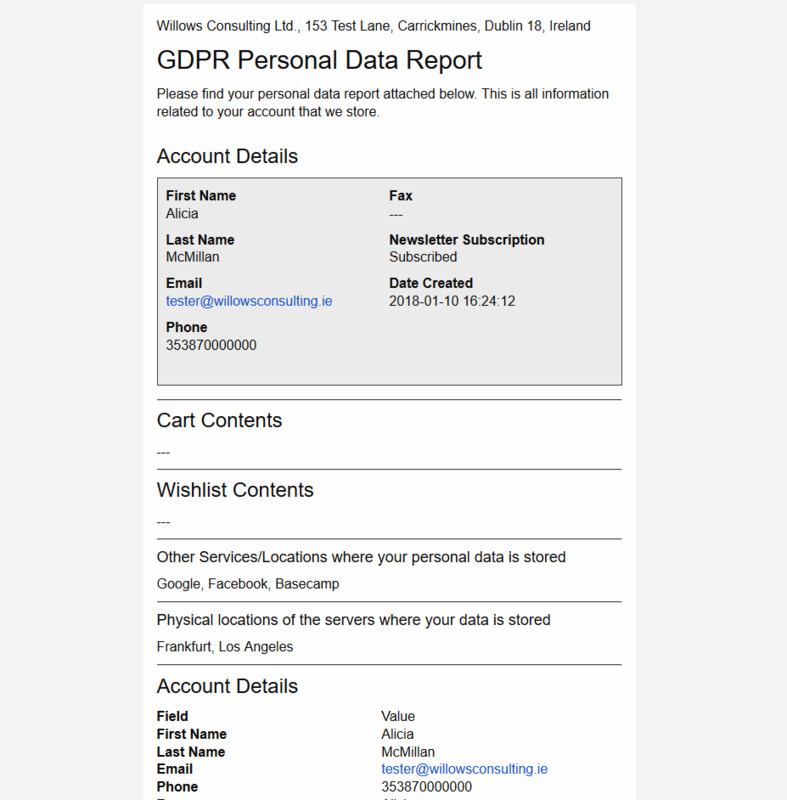 NOTE: No plugin/addon on a website makes a company GDPR compliant. 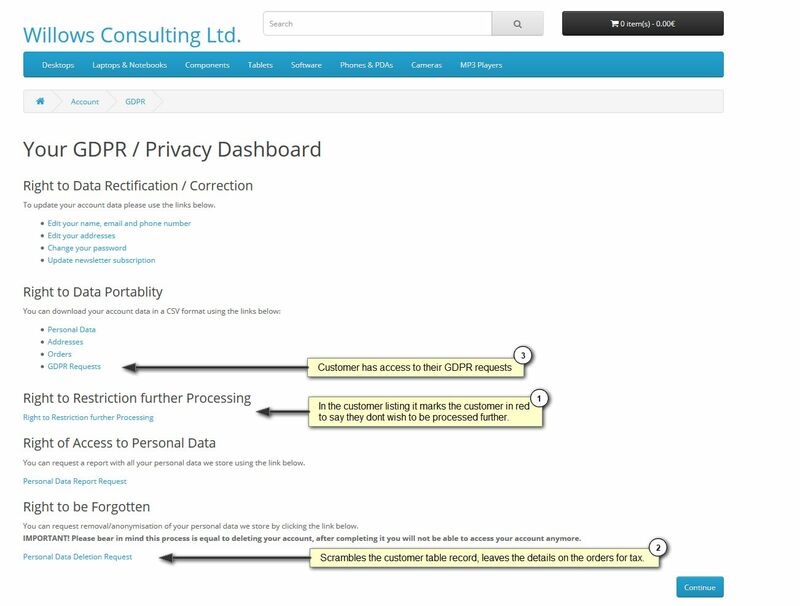 GDPR covers ALL personal data used in and by your business. 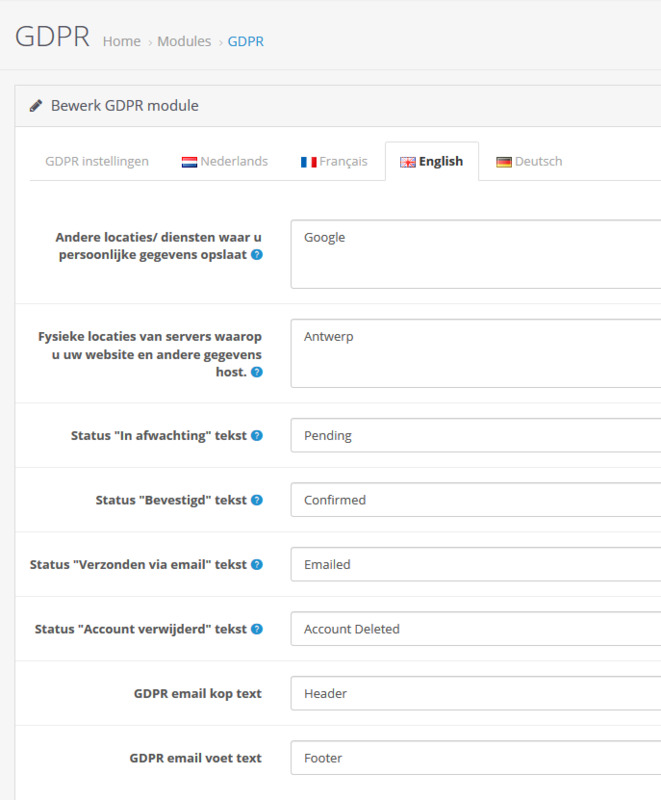 This addon creates a dedicated GDPR account page for the customer in their account view. Step 4. (Personal data request) Customer receives their personal data report by email. Step 5. 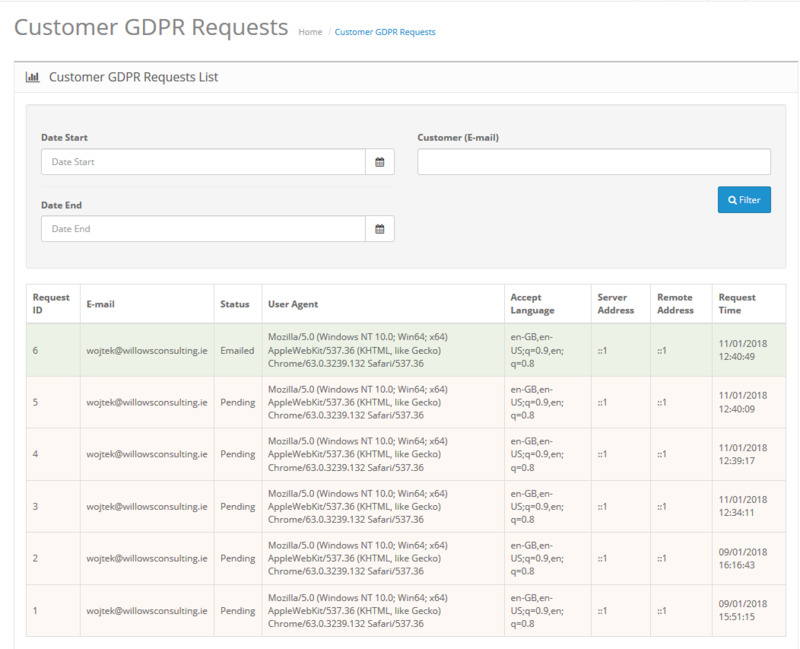 (Forget me request) Customers personal data is anonymized and deleted. 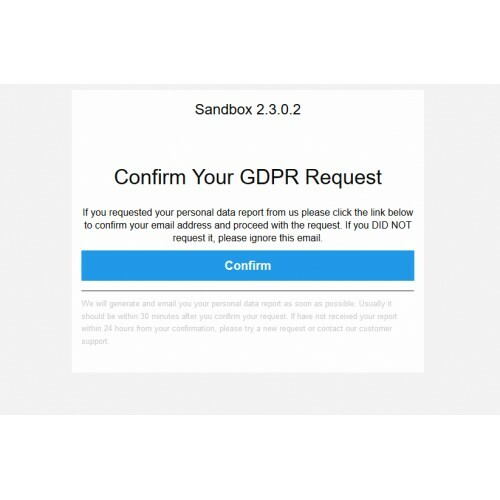 Every GDPR request is recorded. 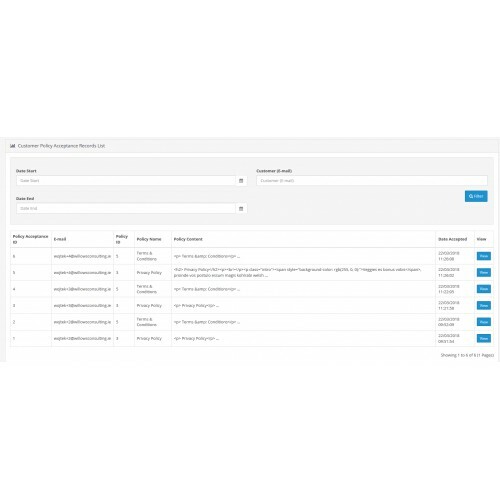 The log of all requests can be viewed by the admin in the reports section of OpenCart. El Reglamento General de Protección de Datos (GDPR) (Control (UE) 2016/679) es un reglamento europeo mediante el cual la Eurocámara, el Consejo de la Unión europea y la Comisión europea pretenden fortalecer y unificar al alza la protección de datos para todos los paises de la Unión europea (UE), controlando también la transferencia de datos fuera de la Unión. Sus principales objetivos son devolver a los ciudadanos el control sobre su información personal y unificar el marco regulador para las multinacionales. De Europese privacyverordening algemene verordening gegevensbescherming (AVG) gaat over de 'bescherming van natuurlijke personen in verband met de verwerking van persoonsgegevens en betreffende het vrije verkeer van die gegevens'. 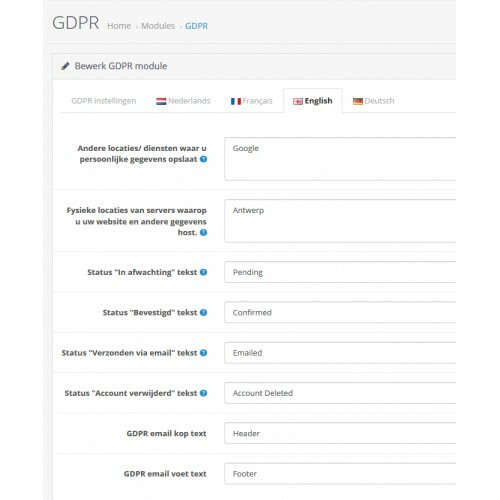 In het Engels heet de AVG General Data Protection Regulation (GDPR). Allmänna dataskyddsförordningen (Europaparlamentets och rådets förordning (EU) nr 2016/679), förkortat GDPR efter engelskans General Data Protection Regulation, är en europeisk förordning med syftet att stärka skyddet för levande, fysiska personer vid hantering av personuppgifter inom Europeiska unionen. EU:n yleinen tietosuoja-asetus, 2016/679 (engl. General Data Protection Regulation, GDPR) on Euroopan parlamentin, Euroopan unionin neuvoston ja Euroopan komission yhteinen pyrkimys yhtenäistää tietosuojaa koskeva lainsäädäntö kaikkien Euroopan unionin jäsenmaiden kesken. EU:n sisäisen säätelyn lisäksi se koskee myös tahoja jotka tallentava EU-kansalaisten henkilötietoja Euroopan unionin ulkopuolelle. Общий регламент по защите данных (GDPR) (Постановление (Европейский союз) 2016/679) — это Постановление, с помощью которого Европейский парламент, Совет Европейского союза и Европейская комиссия усиливают и унифицируют защиту персональных данных всех лиц в Европейском союзе (ЕС). Постановление также направлено на экспорт данных из ЕС. 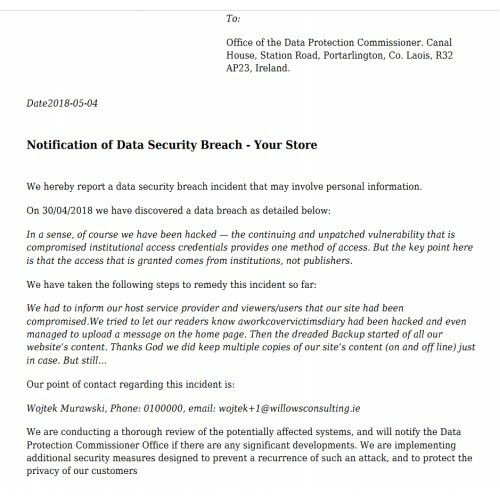 Obecné nařízení o ochraně osobních údajů (anglicky General Data Protection Regulation, zkratka GDPR), plným názvem Nařízení Evropského parlamentu a Rady (EU) č. 2016/679 ze dne 27. dubna 2016 o ochraně fyzických osob v souvislosti se zpracováním osobních údajů a o volném pohybu těchto údajů a o zrušení směrnice 95/46/ES (obecné nařízení o ochraně osobních údajů. Splošna uredba o varstvu podatkov (Regulation (EU) 2016/679, angleško General Data Protection Regulation, GDPR) je uredba Evropske unije, na podlagi katere Evropski parlament, Evropski svet in Evropska komisija nameravajo okrepiti in poenotiti zaščito podatkov o vseh osebah znotraj Evropske unije. Very quick and easy installation, everything working out of the box. I can recommend for sure. Saved me a lot of time and absolutaly worth it. JOB WELL DONE GUYS!!!!! After entering license and use it for few weeks, I go and visit this extension in my OC admin panel today and it just say: Invalid license, please go into module settings and update your license. THIS EXTENSION IS JUST WASTE OF MY TIME, SO NOT RECOMMENDED AT ALL!! !